Artists need natural light, ample work and storage space and an inviting place to meet their muse. That certainly describes Kendal’s new Creative Arts Studio. 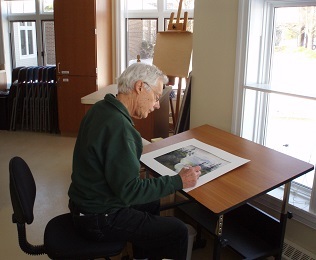 “The architect was very attentive to our needs,” said Don Parker, resident and watercolorist. The studio is designed for both serious artists and novices interested in learning a new skill or just dabbling in one. Residents can reserve storage space and one of the drafting tables, sign up for a class or teach one. Currently Don is leading a watercolor class and his wife, Joyce, is teaching residents how to make pottery. “I tell people to approach it as a child – just dive in,” Joyce said. She has also helped residents who have limitations learn how to make glazed bowls and other pottery. Other residents have expressed interest in teaching collage and paper mache. The room originally housed horticulture, with just a corner reserved for artists. Residents worked in cramped quarters and had to lug their artwork home in between sessions. With the renovation, 12 to 15 people can comfortably work at the same time. The studio can also be reserved for meetings. “What a wonderful space, it is very welcoming,” Joyce said.